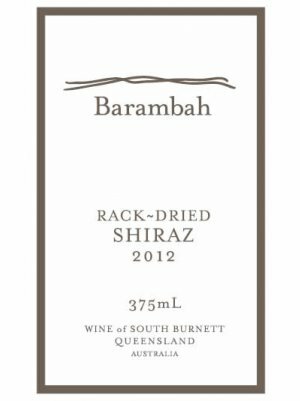 The Shiraz for this wine was hand-harvested from some of the South Burnett’s oldest and highly-acclaimed grape vines, grown in the Barambah Wines vineyard. This wine – from an outstanding 2012 vintage- was made from hand-harvested portions of whole bunches, dried for seven days on racks of Barambah design. Using the company’s special techniques, portions of the harvest are fermented as whole bunches with standard shiraz, and aged in old French hogshead oak for 33 months.The balanced yet rich tannins and powerful flavours of this ancient style and high-quality hallmarks of this mature Barambah Wines vineyard.